The Riviera Maya is characterized by its great variety of activities which you can enjoy during your vacations in Cancun. Among the many places to visit, Xel-há is one of them. It is an aquatic park that you must know and enjoy to the fullest, discover it here. Once at the park, you will witness the quantity of activities there are, however here are some we believe are unmissable. Are you ready for the adventure? Suspension bridge: can you imagine walking from the Caleta to the Caribbean sea on a suspension bridge? This is a very fun activity that you can share with your friends, and the best of all is that this activity is included in the Xel-há all-inclusive package. Chuck Kay Fly: according to the Mayan legends, this was the name of a pelican, this is why there is an analogy between flying like the Chuck Kay and tossing yourself from a liana to the fresh waters of the Caribbean, this activity will accelerate your heartbeat. To access these activities, it is important to book in advance. 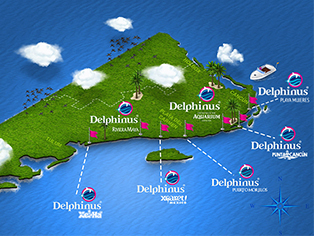 The best way to do it is buying the Dolphinclusive Xel-há, this is an all-inclusive package that includes: swim with dolphins in Cancun + entry to the park + snorkel with dolphins + free transportation + food. jungle, practice trekking in the incredible Mayan jungle. The best of all, is that some of these activities are also for kids. For example, there is a special swim with dolphins just for them: Dolphin kids; another one of the best things to do in Xel-há with kids, is the Kid's World a space dedicated especially for them with an aquatic games area where they will be entertained for hours. The best of the Kid’s World in Xel-há, is that while your children are having fun, you can have a quiet rest in the hammocks near where your children will be playing. Enjoy the Xel-há all-inclusive experience, enjoy all the activities you can do there and share this experience with your loved ones. Visit the Riviera Maya and enjoy the jungle and Caribbean Sea in a unique vacations in Cancún!